Jib clew on Cumulus, Averisera, Tupelo Honey, Enya, and Mojito seen right to left. 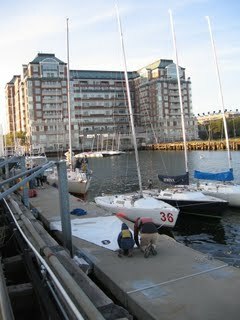 Thanks to Constitution Yacht Club member Tim Sheehan on Cumulus for these images. 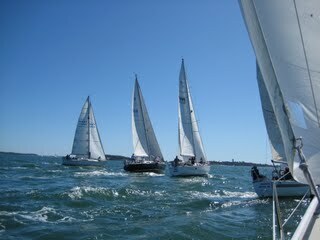 2009 Boston Harbor Islands Regatta. Elizabeth, Norm, Tom Brown, Tara Knowles, and Gladie Austin crewed AVERISERA to a 1st place finish in Class C at 2:15:53 PM. We finished right behind Rockit (Eliot 770), Saga (J-130), and Wild Thing (Frers 33). We were just ahead of a J-35, Copernicus. Not bad company. AVERISERA placed 16th overall. 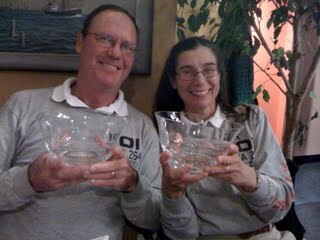 Elizabeth is the top finishing female skipper. Well done Elizabeth! Well done crew. Thirty six boats finished the Fleet One, Spinnaker course. Most of the boats that beat us came from the Class A division boats. Pre-race crew picture from the dock at Piers Park. Five is the perfect number of crew. Look at all the color behind us! The view astern after we transited Hypocrite Channel. A couple of Thunderbirds and few fast J-Boats were ahead of AVERISERA at this point. Lots of smiles and nervous remarks about jinxing us by stating the obvious, "AVERISERA is in the groove." This is our third event. We are beginning to figure out the how, why, and what of a chase race. Smiling crew after the finish. We can't be certain but... things seem pretty good for a win. More to follow on scoring. After party fun at the Courageous Sailing Center in Charlestown. 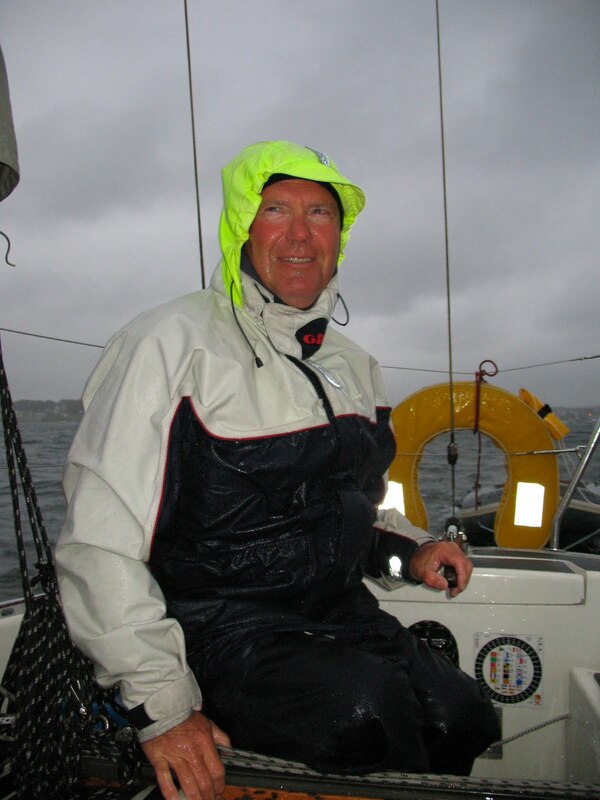 It is fun to mingle with friends, swap stories, cry in a beer, and plan next year's sailing. With boats sailing out of both North and South Shore harbors, the after-race at Courageous was mostly a Boston Harbor fleet party. We look forward to meeting our competitors from away. The view from Courageous. 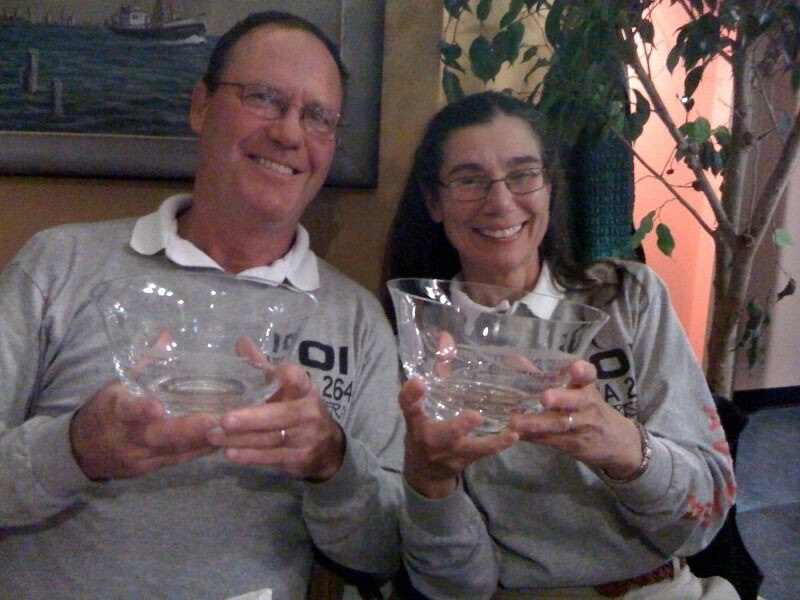 Tom and Norm used to race Courageous J22s in the Constitution YC Wednesday night series. Old memories. Day started out flat calm and very cold. Tom met E & N at home. Gladie and Tara arrived on their own. A team effort to install the numbers, 65, on the bow. The boat was loaded with lunches and gear, rigged and off we all went. The day before, Norm had scrubbed the bottom carefully. AVERISERA looked good. Except for the smudges of black diesel soot on our transom. We were off early and glad for it. Coffee and tea on the way out. Double check the rigging. Tom looking up the weather on his iPhone..."Tom, look around..."
A nice sailing breeze filled in at about 10 knots from the East clocking into the SE during the day. Beautiful swells rolling in from Mass Bay made the first portion more fun than usual. Exciting moments. Getting rolled by the NM 70, Denali. Forcing the IMX 40 Lagosta to tack out from under us at the last turning mark, well done Tom. Losing to the Frers 33 (Class B) in the final moments of the race. Awards dinner at The Daily Catch at Fan Pier in a few days. Soon, time to store the boat and organize the winter project plan. The season may be over but fine memories remain. We were recollecting the best days of the 2009 season. The days we spent, here in Hadley Harbor, Naushon Island, made it to first place. On our way to Newport, RI for the New England Solo Twin Race, we found a quiet anchorage in a stunning little pond. Met some nice cruising folk, paddled and motored around in the dinghy. Paddling through the Western Gut between Buzzards Bay and Hadley Inner Harbor. Next year we are going to try out this "secret cove." Masked bird watcher strikes again. Every cruise starts with a Plan A. It is fun to check off the objectives as they are reached. But.... For every Plan A there is a Plan B. The stuff that actually happens brings unplanned joys. Plan A: Zachary and Tabitha would cruise for a few days with Norm from Boston to Rockland. A rare treat as the kids are now back East. We all took the opportunity to visit the Maine Coast again. Check. Done. Beautiful. Continuing the Plan A: Elizabeth would meet us in Rockland by auto. The kids would drive the car home. Check. Plan A rocks. 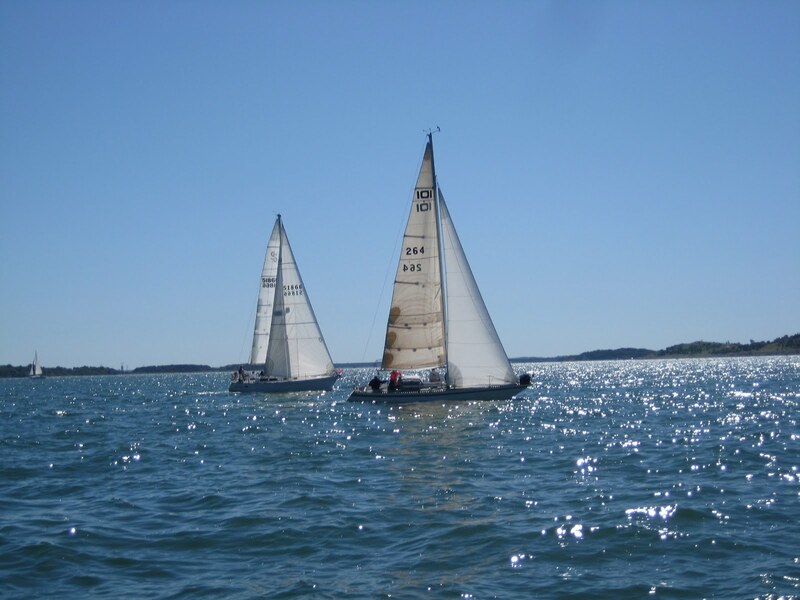 After the kids departed, we planned to attend the Maine Rocks Regatta skipper's meeting, get a good night's sleep, and go double handed racing the next day. The double handed regatta is sponsored by Rockland (Maine) YC and Doug Pope of Pope Sails. Oops! Tropical Inconvenience Danny squashed that plan. Time for Plan B! Plan B: Dodge Danny and cruise home in a sedate manner. Then: "ping." Oops! Plan C? The starboard lower shroud chainplate failed. We used a few vacation days to fix it. A tip of the hat to the technicians at Journey's End Marina, Rockland, ME. Then, we had a comfortable cruise home. Check! Plan C rocks. The essence of a good cruise: a quiet mooring and a hike ashore. AVERISERA in Seguin Island Harbor, Maine. Departed mid afternoon for Tennants Harbor. Got in just in time to score showers at Lyman-Morse Marine. Dinner at Cod End. Best fish cakes in the world! Mosquitos are of heroic proportions, as well. Showers + Dinner ashore with mozzies = Cruising at its best. Monhegan Island. View of the Atlantic from the East side of the island. A whimsical house in North Haven overlooking the Fox Island Thorofare and the yacht mooring field. Z + T + N at the town dock in Rockland. All cleaned up and pretty for mama to come aboard. Hard to imagine that a few hours later the rain and wind from Danny would start. Motoring from a bouncy mooring in Rockland to a quiet mooring in North Haven. The honeymooners (haha) hitched a ride to the market on North Haven Island, provisioned, and walked home. Nice place, friendly folk. One of the two attachment bolts let go. We replaced all chainplates. Why take a chance? During our stop in Rockland at Journey's End Marina a super yacht captain, Mike, who stopped by to visit. He owns a San Juan 33, in Florida. It is a near sister to Averisera. Seeing us cruising our little boat reminded him of his "Eagle 1." He longed to get out cruising on his boat after working on the 111 footer, Adrianna, pictured. We think cruising on our boat is pretty nice, too. Later, we saw Adrianna and Mike in Boothbay and in Boston. This picture is at Carousel Marina in Boothbay. A favorite stop for Averisera. Later, Mike emailed us a picture of his baby. Beautiful. It is interesting to recall the many friends we make during a cruise. Baltimore Clipper, "Pride of Baltimore II" sailing out of the harbor as we arrived that evening. We took pictures of her. Their guests took pictures of beautiful Averisera. 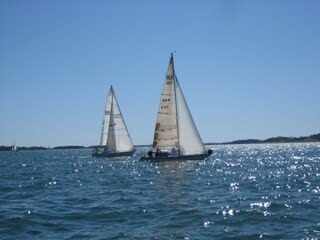 A perfect day of sailing from Long Cove/Tennants Harbor to Boothbay. Long Cove near Tennants Harbor is a quiet anchorage. We shared the space with a 1914 built English yawl, Cooya. The couple said they had cruised her over 20 thousand miles without incident. They may be in Boston this winter. All through the trip, we met and had conversations with interesting sailors. Seguin Light House from the top of the island. The light keepers are an interesting couple from Maryland. 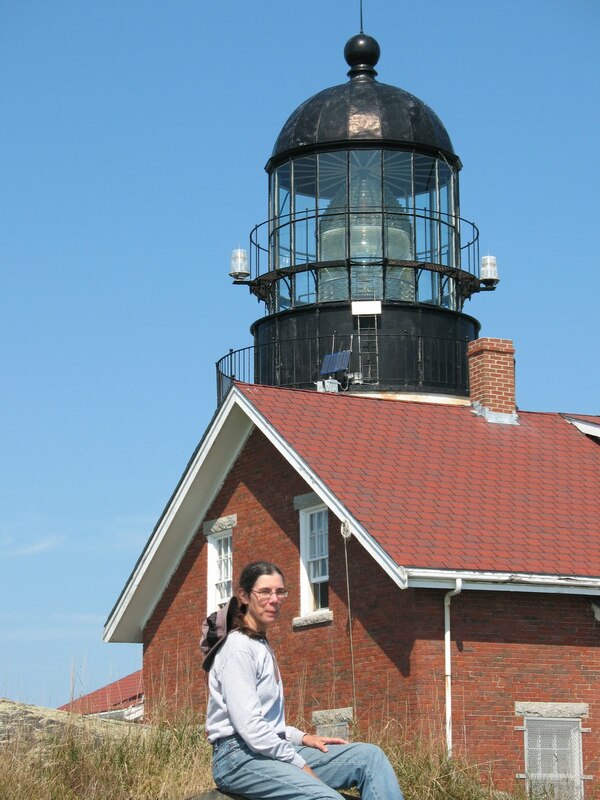 They lived on the island all summer maintaining the grounds and giving tours. Mama seeking shelter from the hot sun. We both have tan lines under our wedding bands! Back in Boston, we encountered a BSC Beneteau 343 sailing out. Big swells from an overnight Easterly rolled through Massachusetts Bay. More photos are in the Facebook album.